Saint Sri Thyagaraja’s music is indeed sublime because it emerged from the privacy of his soul. It is one of the greatest aspects of Sri Thyagaraja that he made the infinite (Sri Rama) accessible to us through music. His numerous kritis include beautiful raagam, bhaavam and taaLam, with lovely lyrics, music, and devotion. 690 kritis in 160 raagams are available today. Music is an inextricable part of Hinduism. The origin of musical notes is traced to the ancient Saama Veda which is one of the four Vedas. While some modern scholars may call this as ‘deceptively simplistic’, yet there are indications from the scriptures such as Bhagavad Gita and saints like Thyagaraja that music does have origin in Vedas. “Among all Vedas”, Bhagavan Sri Krishna says that he “is Saama Veda“. Sage Yagnyavalkya of the Upanishadic period has also clarified that one obtains the boon of moksha by the singing of the Samans to the accompaniment of the Vina, a popular string instrument invariably seen at the hands of Devi Saraswati. He says: ” He who knows the truth of Vina Music and who is an expert in Srutis (musical notes) and Taalas (beats) reaches the path of salvation effortlessly”. 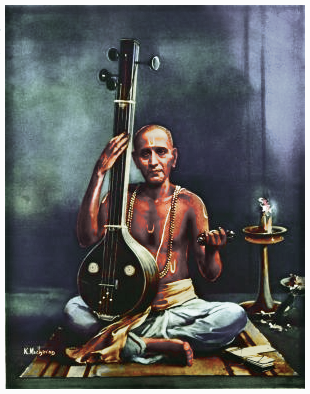 Saint Thyagaraja, one of the greatest propitiator of Bhagavan Sri Ramachandra realised Him through his music. Thygaraja pays obeisance to Narada as his Guru Raya for knowing the truth of Music originating from the Veda-born Vina. The importance of Saama Gaana is inferred from the tradition of Vina being played in major Vedic sacrifices such as Aswameda Yajna. So, dear readers, if you need more info on how Thyagaraja sings the glory of seven swaras tracing their origin to Saama Veda, please read here. In the modern form of Hindustani Classical music, Ramakrishnabua Vaze (1858-1943) was a great proponent of music teaching. He recollects in his book Sangeet Kala Prakash II that once on his return from Nepal, Vaze was the guest of Swami Vivekananda. Swamiji was at that time residing in an ashram at Bareilly. In the presence of a few local music votaries, Swamiji would tune his two tanpuras and to the delight of every one, would sing raaga ‘ahir bhairav’, undisputably a morning melody, in the very small hours of the day, hearing which the residents of the ashrama would wake up! 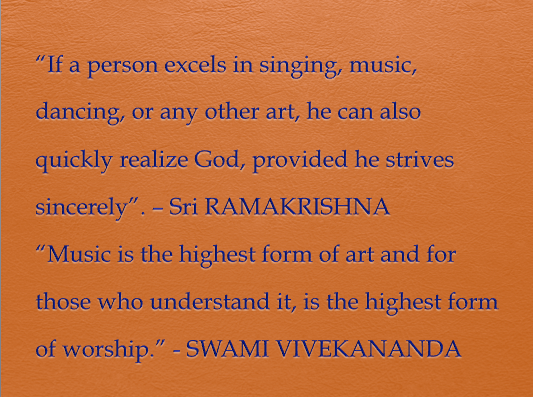 Swamiji was not only an expert musician, but also a poet. He wrote a few inspiring poems in English. I was actually wondering whether these English songs have been ‘tuned-in’ and sung by any one. To my utter pleasure, I found 9 Vedanta songs based on Swamiji’s poems sung here. 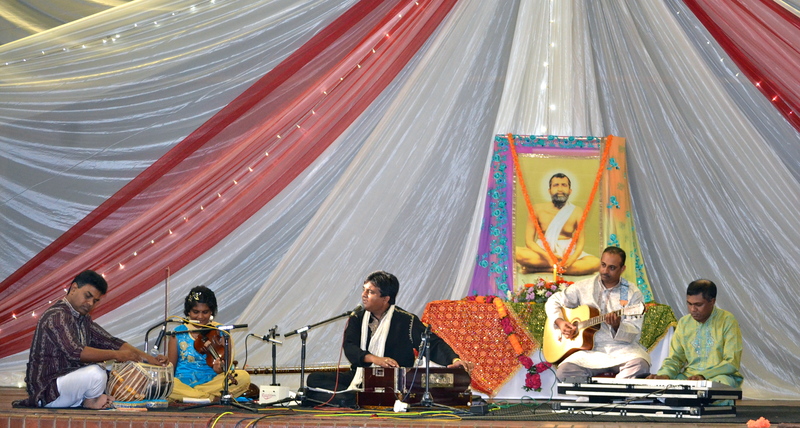 Many of our centres in India encourage the music rendition displayed during several programs. One of our Koklata branches, the Institute of Culture, organises a day-long music program extending into night of the 12th January which is Swamiji’s birthday. Here many talented internationally famous as well as local artistes participate in paying a musical homage to Swamiji. It is not uncommon that such cultural programs are looked upon as a means of fund raising too. When I joined Kanpur Ashrama in 1971, I heard from the seniors that the famous M S Subbalakshmi performed a concert to help build the Library Hall there. Recently the Pietermaritzburg Sub-centre in South Africa arranged a fund raising program for the rebuilding of the upper hall. The music rendition was by Shanjeet Teeluck. The multicultural concert was truly brilliant. The concert began with Pranam Mantra to Holy Trio by Revathy Maharaj followed by a spectacular bharatanatyam dance by Aashmuki Teeluck. Shanjeet Teeluck, together with his accompaning artistes rendered melodious bhajans, ghazals, Golden Oldies and instrumental music. A gathering of approx 600 people intently listened to the melodious devotional bhajans. I was taken to a higher dimension when Shanjeet began his rendition with my favourite song composed by Sri Tulsidasji ‘Sri Raamachandra kripaalu bhajamana’. An air of spirituality radiated in Truro Hall on that Sunday afternoon. 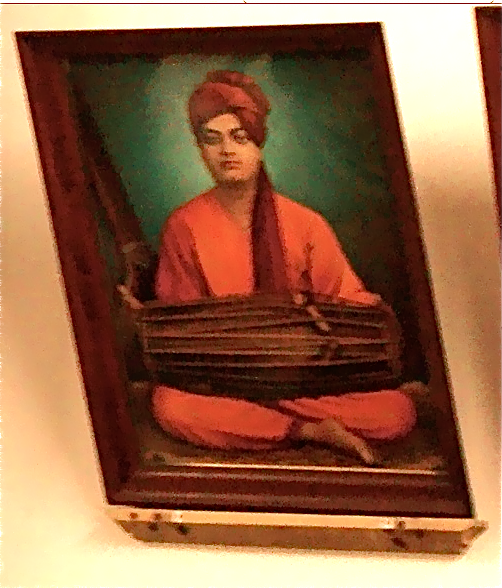 Besides vocal singing, he played deftly Harmonium and Sitar too which added to the sweetness of the cool evening. He was ably assisted by different accompanying artistes viz.,Vishen Kemraj on Tabla, Rajive Mohan on Keyboard, Umesh Inderparsad on Guitar, and the little Shruti, daughter of Shanjeet on Violin. Intermittently Dipika Ramadeen gave enchanting Kathak performances too. The stage was well managed by Ishara Anirudh. Amidst the music outpourings, an invite to me by Barry Swaminathan, who was an MC, to deliver a benedictory address drew me down from the ethereal heights to earthly! Aware of my duty-bound limitation, I stepped onto the stage and tried to recollect how music has been a great source of subjugating the vagaries of mind. I narrated how the raaga anandabhairavi as researched by violin maestro Kunnakudi Vaidyanathan in classical Karnatik music is efficient in bringing down the blood pressure. Though in English grammar classes we are taught that the term ‘composition’ means writing of essays, the very word signify ‘calming of the mind’ as ‘sur‘ implies. Calmness – a state of being composed – comes due to the discipline of mind. That’s why, I added that one who is indisciplined is called ‘a-sur’. The mythological asuras are none but a bunch of indisciplined lot! Then I went on to appeal to all the connoisseurs to train their children in any form of fine arts. And the next Sunday evening once again took me delightfully to Kendra Hall in Durban where I was absorbed in a bhajan sandhya program of Pandit Ravindra Joshi accompanied by his wife Bhavna Joshi. The duo sang some wonderful bhajans. The instrumental background was indeed impressive. At the seeing of this article my heart and mind moved. I delight with this article. Many Thanks Maharaj for that! I feel so blessed to play for the Master, Mother and Swamiji. Dear Maharaj, I bow down at your Godly feet. You are truly blessed to be given an opportunity to play Cello for Holy Trio. When I listened to your music (thanks for the beautiful videos), it felt so pure, so good, God manifested Himself in that music. In a pure body and a pure mind God is always palpable. Always keep in mind that you have the Grace of Holy Mother! May Mother bless you! With prayers and hearty greetings on the eve of Holy Mother’s birth tithi ! Maharaj! Thank you for this wonderful offering once again; it never fails to inspire me to divinity. I recall from the Gospel how Master used to go into samadhi whilst listening to Swamiji’s singing. Good music and singing have that ability to elevate one’s mind to the higher plane. When I read these wonderful accounts, I always think how nice if I lived in the times of Swamiji and be in his company. Those who take the Name of God become world movers! When you dedicate yourself to Him and to His seva, know that you have become dear bhakta to the Lord. Yes! the bliss and peace of song, poetry and music bring us closer to the Lord creating joy within ourselves. We have come here for a very short time so let us strive for intense, maddening love for God! I was so thrilled to read the article on music. Music was, is and will always be one of the best ways to relax and elevate the mind and soul. Sri Shanjeetji’s style of singing is truly remarkable. We all thoroughly enjoyed an evening of soothing music and spectacular dance. Revered Maharaj ji’s address was also very inspiring and we could easily detect the approving nods from the audience during Maharaj ji’s Talks. Thanks for your appreciative words! Yes, music is really elevating and soothing. I too enjoyed the charming music by Shanjeet. Music is another reflection of God’s love and existence. I do find music in the rustling of leaves while sitting quietly in the veranda of my room; the incessant chirping of birds in different tones appear to me to be an orchestral rendering of the prakriti Mother! And what to say of the cool breeze that take away all my tiredness and make me look onto the passing cumulus clouds which are the master pieces of the unseen hands’ drawings! With prayers and hearty greetings on the eve of Holy Mother’s birth tithi! I really miss your Postings very much. Your writing took us in different world of Music. Specially Photo of Swamiji playing Pakhawaj is very very inspiring!! We had arranged Rudra Veena Recital by Great Maestro Shri Bahauddin Dagar at Mumbai Ashram on 27th November in front of full house. Maharajji, Please keep on showering words full of Bliss and Inspiration. Trust you are keeping well. Much so however I wish, many a time, my own spiritual sadhana, ministration and public programs do not afford sufficient time to sit on my computer; yet I do try as much as possible in keeping touch with this blog. I am indeed grateful for your keen interest. Happy that you feel inspired at the photo of Swamiji playing pakhawaj. How I wish that I was at Mumbai ashram to have listened to Rudraveena recital! With prayers and hearty greetings on the eve of ensuing Holy Mother’s birth tithi ! Your article has moved me beyond words. I beg to submit that, due to the divine grace of Sri Sri Maa, I could pay my respects at Holy Joyrambati on the occasion of Sri Sri Phalaharini Kali Puja as well as Sri Sri Jagaddhatri Puja this year. The highlight of the sacrosanct Puja rituals on both occasions, at this holiest pilgrimage shrine, was the sacred music of ‘Kali Kirtan’. We, the devotees, were simply mesmerized by the divine music of ‘Kali Kirtan’, sung by the revered monks themselves. ‘Sur’ in each of the song immediately cast its spell on all devotees assembled there and for a moment, all of us felt transported to another world. The divine music echoes in our heart even now. On coming back, I have now taken to the practice of singing ‘Bhakti Geeti’, in front of Sri Sri Thakur and Sri Sri Maa, as part of my morning meditation at home. And I feel so serene, even after coming to office! Such is the grace of ‘Sur’! Divine Ma has showered you with Her infinite Grace! You were truly blessed to be in Jayrambati during ‘Sri Sri Phalaharini Kali Puja as well as Sri Sri Jagaddhatri Puja this year’. I can well imagine the divine atmosphere that prevails in Jayrambati especially during times of special worship. One’s heart, mind and soul are transformed in utter purity when one hears divine music. Man achieves greatness, large heartedness and guilessness by tapasya of many births and again through the divine grace. Happy to hear that you have adopted singing bhajans during your regular sadhana. Its wonderful. It actually helps focus the mind on your ishta. I do adivise this method here as one of the means to get more devotion, if only one can understand the meaning of words. In this country though people are devoted, the bhajan meanings are lost due to their unaware of the Indian vernaculars. Hence for many bhajans and hymns we have given the English meanings in our published Prayer Book. May you dive deep into the ocean of bliss and attain devotion and knowledge. Truly beautiful an article. The close proximity, nay, even the intertwining of the artistic and the spiritual whether in content or form is a theme which has exercised eternal fascination for artists and seers alike. As Sri Ramakrishna used to say, an artist is closer to God. Man is truly declared a man when he pursues intellectual pleasures, otherwise he is homo but not so sapient:)! In India where the lines between art and spirituality are so blurred, when our greatest saints have been our finest poets, musicians and composers, and vice versa… this is especially true. The relevance of rhythm and incantation can be inferred also from the complete absence of writing before the Buddha. Greek ambassadors reported that the common folk would remember by rote what was told even once, and that there was no paper!! Your take on “composition” is wonderful, as also ‘sur’ and ‘asura’. Thank you for this intellectual treat. Many thanks for your appreciative comments! Yes…I am in total agreement with your points on this topic. Music and poetry is as much food for the soul as is meditation. Knowledge, love, purity as well as their expressions in the form of laya and taal (rhythm and beat) and raag (tune) belong to our very nature. How wonderful when I see in a gathering of singing devotees, a child of 3 years start dancing clapping to the rhythm! Today is Holy Mother’s Tithi Puja, the 17th of December, and I have been to the Ashram today by Her grace. Please accept my dandavat pranam and warmest greetings on this king of holy occasions. 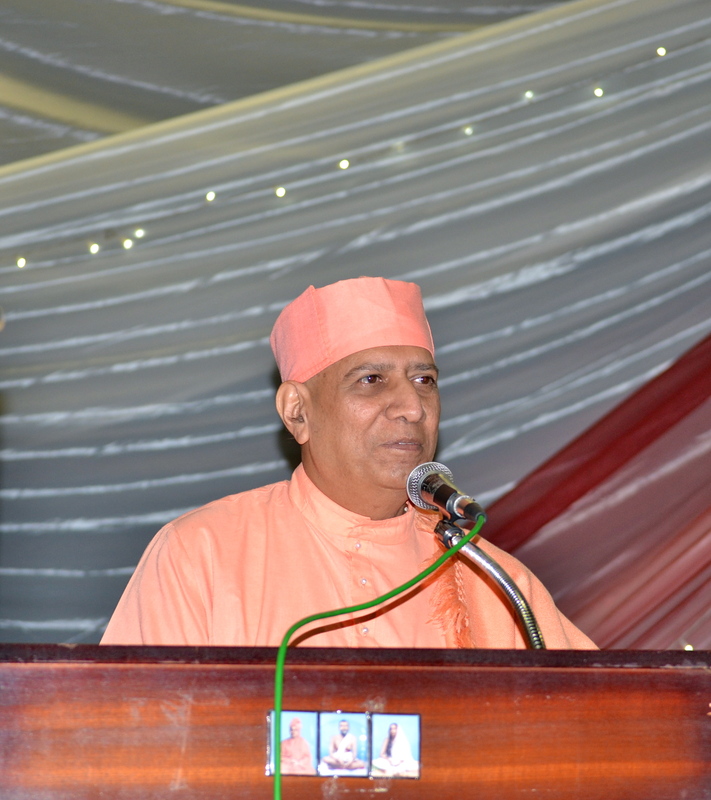 Today Swami Shantatmanandaji Maharaj’s discourse moved many of the devotees to tears, infact, we could discern Revered Maharaj was also choked up many a time speaking of the Sarvajanani and restrained himself with some effort. Once again heartfelt greetings and regards! It was a delightful article and a soul stirring picture of Swamiji. Can you please write the whole song of Rabindranath which Swamiji had set tune to. Also if you can quote at least one English poem of Swamiji I shall remain ever grateful. It is undoubtedly the Grace of Thakur that is keeping this body and mind well. Many have appreciated the picture of Swamijee which is so good to note. I shall certainly try to write the song of Rabindranath which Swamiji had set tune to and send you by email. Here I quote, on your request, an English poem of Swamiji. Swami Vivekananda wrote 33 poems including two translations, eight in Bengali, and four in Sanskrit and one in Hindi. From among these poems- only three – “To the Awakened India”, “To the Fourth of July” and “Kali the Mother” form a group by themselves as they were all written in Kashmir during his visit in the year 1898. During the days of pilgrimage to Kshir Bhawani (Kashmir), Swamiji was in such a high spiritual state that it seemed indeed as if his physical frame could not bear it for long. Swamiji worships the Terrible here. The universe provides a stage for the enactment of the Mother’s frenzied dance. Read and get inspired! The clouds are covering clouds. Destoys a world for e’er. My pranam at the feet of Holy Trio & Maharaj. I read the article. Thanks Maharaj for the great article! To me, music is the way which gives me mental relaxation & takes beyond the sense world. Music is the only thing which touch our mind & soul very fast. Maharaj, my son Udbhav was suffering for one month. Please keep him in your prayers. Nice to know the influence of music in your life! I am concerned about Udbhav’s health. How is he now? Are you giving sufficient medical treatment? Every one of us intermittently fall sick. But this is the time that the child gets utmost attention from the parents. Serve him feeling that he is none but sent by Thakur to you. I would definitely keep him in my prayers. Wish him well soon.